That’s true in that sense, but presumably for historical adventures it might be necessary to edit the scripts to reflect how people in different time periods might respond to a female Doctor. But that needn’t become a major part of the story, necessarily. Or they could just ignore it as they did for the most part with Martha. Yeah, it’s certainly an option. Although I quite liked the way they acknowledged it with Bill (like in Thin Ice) - and actually maybe taught some viewers a little bit about historical race-relations in the process. It does say in the article these things may come into play in historical episodes. Both for her and the companions. I think they balanced it quite well with Martha actually. In the Shakespeare one he commented quite often on her being a rare and exotic beauty or similar non-PC words to that effect. The Manhattan episodes it’s not that relevant as black women would be commonplace and it wasn’t a segregated part of the country. In Human Nature it’s a little skirted over but her disguise as a maid ‘from the colonies’ wouldn’t be too unusual. I think the balance is you have to find a way to make the scenarios realistic without forgetting it’s primarily a family adventure show and not searing political commentary. The show, like a lot of family scifi, deals with issues, but it’s not a kitchen sink drama. And Martha could’ve had trouble with racism and sexism in her modern day adventures. Bill could’ve had racists, sexists and homophobes getting in her way. What DW has mostly done since it was relaunched with RTD in charge is go for representation. He put openly gay characters in the show and… it was fine. People kept watching. So we’ll see what Chibnall has decided to do…? This sounds promising. Most of the Doctor Who books are a bit old for my kids, but a 7+ book should be perfect. I thought from the title it was going to be a crossover with Fallout. Michelle Gomez , who played the Doctor’s best friend and wicked enemy, Missy , in the recent Doctor Who television series, will be returning to the role in some brand new audio adventures from Big Finish Productions made in arrangement with BBC Studios. Throughout her time on Doctor Who , Missy – an evil incarnation in the guise of a Victorian nanny – was a delightful devil, at one point sentenced to death for terrible crimes against the universe. And now we get the chance to hear more of what she is really capable of. Michelle Gomez told us about letting Missy loose on the people of the universe: “I was very excited to return to Missy’s world via the medium of audio because along the way I’ve always had a lot of fun with Missy ; her voices and her rhythms. I absolutely love capturing it and distilling it down to the word on the page. And (whilst evading the Doctor’s clutches) Missy will encounter another enemy of her ‘boyfriend’ as she crosses paths with the Meddling Monk played by Rufus Hound . David Richardson , producer of these adventures told us more: “Missy’s own series is just like the Time Lady herself – anarchic, funny, unpredictable and wildly imaginative. It’s absolutely glorious to have Michelle returning to the character at Big Finish, and our recording days have been filled with so much laughter. More seriously: It looks great in terms of production values, but the presentation still feels a bit odd in terms of its tone, to me - as though it’s trying to cut together what look to be fairly typical Doctor Who stories for the trailer, but in a way that better sells the show to a more mainstream audience. Which is understandable, but it means I don’t really feel like I’m properly getting a sense of what Chibnall’s vision for the show is going to be. And the music still feels really incongruous. On the plus side so far it has avoided my pet peeve with Doctor Who trailers, revealing all the baddies and several plot spoilers in every one. That does end up being a rather generic trailer but as I’m going to be watching anyway I think I prefer that. Yeah, I’m not unhappy with it, and I quite like the fact that we still don’t really know what to expect, a couple of weeks away from transmission. A couple of other new bits. There’s a new opening title sequence too, and a new arrangement of the opening theme, by our brilliant new composer Segun Akinola. You’ll have to wait until episode two to see those in situ, though. Episode one starts sightly differently. So presumably The Woman Who Fell To Earth will open ‘cold’. Here's what's next after Jodie Whittaker's debut. Yeah… I really like Whittaker as Doctor, and I’m okay with a crowd of companions, but… the music is trying to sell this as ALL NEW! and edgy and whatnot, and that just serves to make me terrified that this will be another Torchwood after all. How much say does Chibnall have in the marketing though? 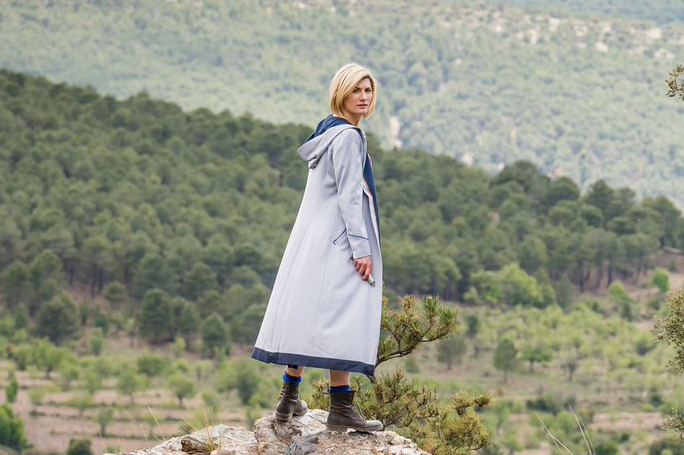 The music is clearly leaning into the fact that the doctor is now a woman but I doubt any of that style of music will actually be used in the show. Don’t know, I assume he can veto it or at least make a strong argument if he really hated it but I agree I tend to think it’s more for the trails than the actual show. I’ve heard samples of the new composer and it’s pretty good stuff. It’s more that I’m worried that they chose the music they thought was right for the kind of show this season is supposed to be, you know? Presumably the people who make the trailers have some idea of what Chibnall is doing. And I wasn’t refering to the music leaning into the fact that the Doctor is a woman, but rather that it’s all hip-hoppy. You know, making it clear that THIS ISN’T YOUR DADDY’S DOCTOR!!! It’s more that I’m worried that they chose the music they thought was right for the kind of show this season is supposed to be, you know? I don’t know if it’s that or just a case of wanting to broaden the appeal of the show. The core fanbase will watch it no matter what, so why not reach out to others with a trailer that feels a bit more broad and accessible? It feels like they want to make the first Whittaker episode a real event and get as many eyes on it as possible, so I can understand advertising it in that way - the kind of ad you’d see for a more mainstream drama. And I wasn’t refering to the music leaning into the fact that the Doctor is a woman, but rather that it’s all hip-hoppy. I like that aspect, I think there’s every right to blow the dust of with a track like that. I’m not sure who it is, my first guess is Ariana Grande, but I’m sure it didn’t come anyway near as cheap as in-house composition and makes a clear statement that the show is new and fresh for this era of more stringent diversity. Who fans are going to watch it no matter what, I’m pretty happy that they are aiming to bring new fans in. Djing to kids these days I’ve also noticed there is not much of a gap between girls and boys music. Those gender rules of music style have faded greatly. So I guess they are marketing to the whole of generation i as hard as possible with it, not just girls.